A delegation from the State Council (SC) led by it president Abdulrahman Sewehli is due to arrive in The Hague later this week following invitations from Dutch foreign minister Bert Koenders to both the SC and the House of Representatives (HoR) to visit the Dutch capital for talks. The invitations are part of a bid by Koenders to break the current stalemate in the Libya crisis and kick-start the dialogue between the two chambers to amend the Libyan Political Agreement. 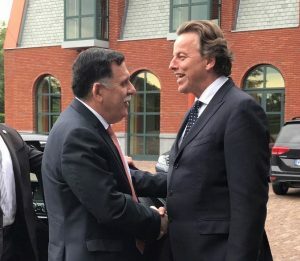 Within the context of The Netherlands’ developing Libya initiative, Presidency Council head Faiez Serraj was in The Hague last week and an invitation to visit is also believed to have been extended to Khalifa Hafter. The Netherlands has also agreed to reopen its mission in Tripoli, with one diplomat in residence for the time being. An HoR delegation also appears ready to fly to The Netherlands. A spokesman for HoR president Ageela Saleh has confirmed that that an invitation was received and was the subject of discussions in Tobruk yesterday between Saleh, the heads of parliamentary blocs and members of the dialogue committee. One member of the dialogue committee, Benghazi MP Ziyad Daghim said that it had been agreed to send a delegation to The Hague and that it would be led by Qasr Libya MP Khalifa Al-Daghari. But there is some opposition to the Dutch move. Tobruk member Saleh Ben Abdul Nabi who is also member of the dialogue committee has publicly opposed the Dutch initiative, insisting that the HoR-SC meetings should be inside Libya and under the guidance of the new UN special envoy Ghassan Salamé. The head of the committee Abdussalam Nassiyah is also believe to be unhappy with it while Ageela Saleh, who is regularly accused of not wanting any progress at all on the Libya crisis, has similarly indicated that he does not want any dialogue sessions outside the country. The Dutch invitations follow a visit to The Hague in May by SC and HoR delegations. Prior to that there were talks between Dutch foreign ministry officials and members of the HoR and SC.